The Armored Divisions: The US Armored Divisions, What They Were and A Brief History Of Each One. There were two types of US Armored Division during WWII. The Light type and the Heavy type, I will detail out the differences between the two below. Armored Divisions were not meant to be assault troops, that was left to the Regular Infantry Divisions, the Armored Divisions were meant to rush through an breakthrough and romp and stomp as far into the enemy’s guts as they could, hopefully taking key objectives and cutting off large amounts of enemy troops. A light US Armored Division was made up of three Tank Battalions, three Armored Infantry Battalions, and three Armored Field Artillery Battalions. These were broken up into three Combat Commands, A, B, and R. Each of these had a Tank Battalion, an Armored Infantry Battalion, and an Armored Field Artillery Battalion and each one was commanded by a Colonel. Commands A and B were the primary combat force of the Division and R was the reserve. The Battalions could be swapped around between A, B, and R(sometimes called C) depending on strength and fatigue levels. These units could be broken down into smaller, usually company sized sub units and assigned to the Combat Commands depending on the needs of the missions. The Armored Division was intended to be a self-contained unit with all the assets needed to support and move itself around a theater. A light Armored Division had an authorized strength of just about 11,000 men, the Heavy Division had 14,500. The main difference with a Heavy Armored Division was they had eight Medium Tank Battalions, instead of just three. They also had more light tanks, with two full light tank battalions, instead of three companies. 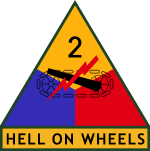 Only a two Armored Divisions retained the heavy designation and organization through the whole war, the 2nd and 3rd. I have not been able to find a TO&E for a Heavy Armored Division that included an Authorized strength, but it would have to be several thousand men more than a normal AD. I’m not 100% sure on this, but I’m pretty sure the Heavy Armored Division was done away with in a 1942 revision of what an Armored Division was, but a pair retained the Heavy TO&E for reasons I’m not sure of yet, but I will find out. The Armored Divisions were meant to exploit a major breakthrough won by the regular Infantry Divisions. In many cases they were not used this way, and often got thrown into the lines as the enemy was faltering, using a single Combat Command to help secure the breakthrough while the rest of the Division rushed through the breach. No Armored Divisions saw use in the Pacific, but the Sherman sure did. The Sherman was really the heart of the US Armored Division, and its mobility and reliability really served it well there, it allowed US Armored Divisions to make very long runs once broken through, and it would limits on fuel supplies, not the tanks mechanical reliability that slowed it down. The oldest US Armor Division. It saw a lot of action in WWII, born on July 15 1940 at Fort Knox. The 1st AD spent its early years figuring out what an Armored Division was going to be, and when they figured that out, they trained in the US until mid-summer of 1942 before shipped off to Northern Ireland, after a short stay they were off to England. They were not there long, before they were shipped off to northern Africa for participation in Operation Torch. The 1st AD would be the first US Armored Division to see combat. They would participate in the capture or Oran, and the infamous Kassirine Pass, and then would fight to the end of the war in Italy. The primary tank early on would have been the M3 Lee and M3 light. By the Italian campaign it was the M4 and M4A1, small hatch 75 tanks, with M5 lights. Late in the Italian campaign they would have gotten second gen 76mm Shermans. 1st AD Subunits: 1st Tank Battalion, 4th Tank Battalion, 13th Tank Battalion, 6th Armored Infantry Battalion, 11th Armored Infantry Battalion, 14th Armored Infantry Battalion, 27th Armored Field Artillery Battalion, 68th Armored Field Artillery Battalion, 91st Armored Field Artillery Battalion, 81st Cavalry Reconnaissance Squadron, 16th Armored Engineer Battalion, 47th Armored Medical Battalion, 141st Armored Signal Company, 501st CIC Detachment. Campaigns: Tunisia, Naples-Foggia, Rome-Arno, North Apennines, Po Valley. The 1st AD had 1194 men KIA, 5168 WIA, and 234 DOW. They captured 41 villages or urban centers. 108,740 Germans gave up to the 1st AD. The 1st AD earned 1 Distinguished Service Cross, 1 Distinguished Service Medal, 794 Silver Stars, 2 Legion of Merit, 35 Soldiers Medals, 1602 Bronze Stars, and 3 Air Medals. They were moved to Germany Shortly after the war to serve as part of the occupation forces and were disbanded in 1946. They were reactivated in 1951 and are still an active duty division to this day. The second US Armored Division put together and it saw just about as much as the first. This was one of only two Heavy Armored Divisions; all others were converted to the later ‘light’ TO&E. Formed at Fort Benning on 15 July 1940, on the same day as the 1st. They shipped out for use in Torch, but were kept in reserve until the invasion of Sicily. They saw a fair amount of action on Sicily, and after were shipped back to England to be used in the Normandy landings. The 2nd AD was landed on Omaha Beach on June 9th and fought in northern Germany until the end of the war, including the Rhineland, Ardennes and Central European Campaigns. 2nd AD Subunits: 41st Armored Infantry Regiment, 66th Armored Regiment, 67th Armored Regiment, 17th Armored Engineer Battalion, 82nd Armored Recon Battalion, and the 142cnd Signal Company. There was also the 14th Armored Field Artillery Battalion, 78th Armored Field Artillery Battalion, 92nd Armored Field Artillery Battalion, 2nd Ordnance Maintenance Battalion, and the 48th Armored Medical Battalion. Campaigns: Sicily, Normandy, Northern France, Ardennes, Rhineland, and Central Europe. The 2nd AD Combat statistics: had 1102 KIA, 5331 WIA, 253 captured, 7116 non battle casualties, for a total of 13,867 casualties. They were in combat for a total of 223 days and earned 21 DCS, 13 Legions of Merit, 1954 Silver Stars, 131 Soldiers Medals, 5331 Bronze stars and 342 Air Medals. They took a grand total of 76,963 POWs. Also maybe known as the Third Herd, but may be post WWII. The 3rd saw combat from Normandy to the end of the war in Europe. They were formed on 15 April 1941 at Camp Beauregard in Louisiana. They trained in California at Camp Young, until January of 1943, when they moved to Indiantown Gap Military Reservation in Pennsylvania. They would train on there while waiting to deploy overseas. The 3rd AD arrived in Europe on September 15th 1943, they debarked in the Liverpool an Bristol area and trained there and on the Salisbury Plain preparing for the invasion. They would first see combat almost a month after the June 6th landings in Normandy. They would fight in the hedgerows, including at Saint Lô. Later in the same campaign they would help close the Falaise Gap. They participated in both the Battle for the Hurtgen Forrest and the Battle of the Bulge. They would continue to fight into Germany, helping with the taking of Cologne, and Paderborn, and with reducing the Ruhr Pocket. They liberated the Nazi Death Camp at Dara-Mittelbau, and finished with the battle of Dessau. They went into reserve to the end of the war. It did a short stint as an occupation force before being deactivated in November of 1945. It was later reactivated in 1947. 3rd AD Subunits: 36th Armored Infantry Regiment, 32nd Armored Regiment, 33rd Armored Regiment, 23rd Armored Engineer Battalion, 83rd Armored Recon Battalion, 143rd Armored Signal Company, 391st Armored Field Artillery Battalion, 67th Armored Field Artillery Battalion, 54th Armored Field Artillery Battalion, 3rd Ordnance Maintenance Battalion, and the 45th Armored Medical Battalion. WWII Campaigns: Normandy, Northern France, Ardennes, Rhineland, and Central Europe. The 3rd AD WWII Combat Data: spent a total of 231 days in combat, with 2540 KIA, 7331 WIA, 95 MIA, and 139 captured. They had a total number of Battle Casualties of 10,105, Non-Combat Casualties 6017, and a combined total of 16,122. They took 76,720 POWs. They earned 17 Distinguished Service Cross, 23 Legion of Merit, 885 Silver Stars, 32 Soldiers Medals, 3884 Bronze Star, 138 Air Medals, and 3 Distinguished Flying Cross. 4th Armored Division: The no name AD! One of the few Armored Division that never adopted a name, it also developed a reputation. The 4th was often used as the spearhead for Paton’s Third Army and it was a tough outfit. Their motto was ‘They Shall Be Known By Their Deeds Alone’. Activated on April 15th 1941 at Camp Pine (Later named Fort Drum), New York. It would train at Camp Forrest in Tennessee, and then was shipped to California for further training at the Desert Training Center. They would be housed at Camp Ibis, near Needles California during this period. By June of 1943 they would be at Camp Bowie, Texas, for more training in the Piute Valley. They were then off to Camp Myles Standish in Massachusetts for winter training. Finally, in December of 1943, they were on their way to Europe, England specifically to prepare for the June of 44 invasion of Normandy. The 4th AD debarked in Normandy on July 11th 1944, at Utah beach and was in combat by the 17th. They saw action in Operation Cobra, and rampaging across France, they would see action in the Battle of the Bulge, spearheading Patton’s 3rd Army’s attack north to hit the Germans attacking Bastogne. They would see action in all the major fights in the ETO to the end of the war. They did a tour as occupation forces before being shipped back to the ZI to be deactivated. The 4th AD spent 230 days in combat and lost 1238 KIA, 4246 WIA, 503 MIA, and 1 man captured. 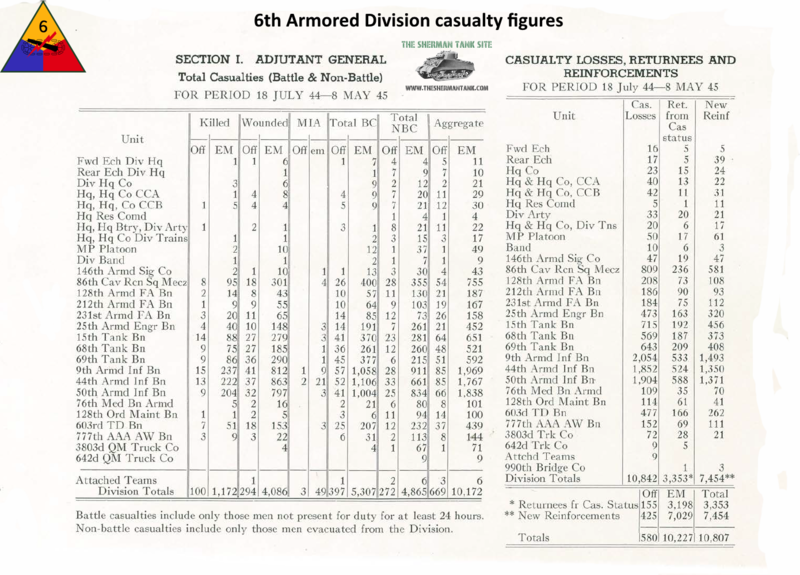 This totaled out to 5988 Battle Casualties, they also had 4508 Non Battle Casualties, and total of 10496. The 4th took 90,364 POWs. Another Divisions that saw combat from Normandy to the end of the war in Europe. The 5th AD was activated at Fort Knox, in Kentucky. Like many units after forming and some initial training, the shipped out for Camp Cooke California. They spent a lot of time on Alert for Japanese attacks in their early training there. Next up was training in California’s Mojave desert. They were on their way to Tennessee by March 24th for more maneuvers. They would be there until July, and then they moved to Pine Camp N.Y. for some winter training. The 5th last stop before deploying to England was Indiantown Gap, PA, where they left their vehicles and were trucked to Camp Kilmer NJ, to wait for their ship. The 5th were in England by February 24, 1944, and they were stay there until they deployed to Normandy on July 26. They were assigned to Patton’s Third Army, as “General Patton’s Ghost Troops”, and would fight in Normandy, Northern France, Ardennes, Rhineland and Central Europe Campaigns. Paths of Armor: The history of 5th Armored Division. 396 high quality pages of history on the 5th AD. NEW BOOK! The 5th AD was in combat 161 days, and had 547 KIA, 2768 WIA, 177 MIA, and 62 captured for a total of 3554 battle related casualties. 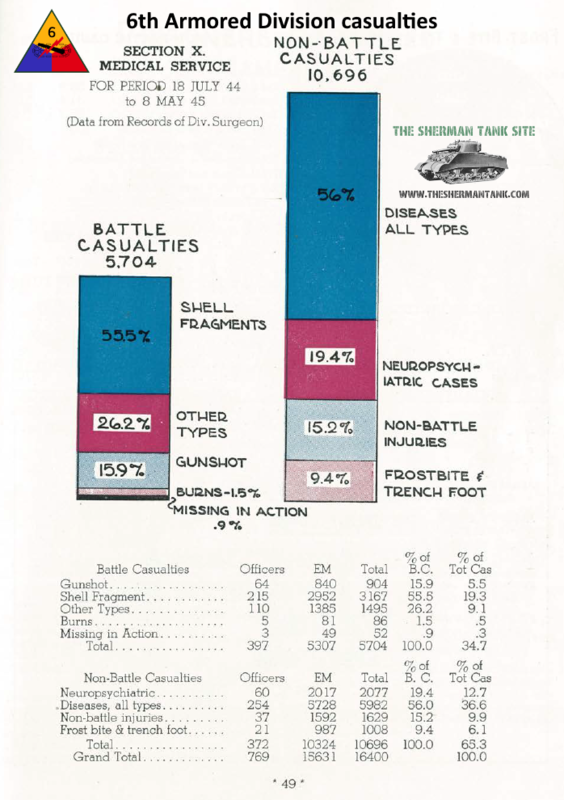 The 5th also had 3592 non-battle casualties, for a total of 7146. 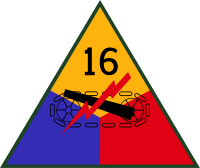 The 6th was activated at Fort Knox on February 15th 1942. The 6th spent time at Camp Chaffee, Arkansas training then went on Maneuvers in Louisiana and then they were off to sunny California for training at the Desert Training Center in Mohave CA, and then off to Camp Cooke also in Ca. They were shipped by train to the east coast and loaded onto ships for transport to England, arriving in February of 44. The 6th was landed on Utah beach on July 18th as part of Paton’s 3rd Army. They participated in the Normandy, Northern France, Ardennes-Alsace, Rhineland and Central Europe Campaigns. The 6th spent a total of 226 days in combat. They had 1169 KIA, 4198 WIA, 152 MIA, and 7 captured for a total of 5526 battle casualties, they also had 7290 non battle casualties. The Combat history of the Super Sixth: 182 pages, ok scan with a lot of very good info. NEW BOOK! The 8th AD has a very nice website linked above. I spend a lot of time on the Thundering Herds website, and it’s good stuff. This AD came in toward the end and only fought in three major campaigns. They did help secure some key bridges over the Rhine River though. They saw combat for a short time, three campaigns, but had a pretty cool nickname. You can read their unit history here: Impact, the battle history of the Tenth Armored Division NEW BOOK! This AD came in late in the war but saw a good amount of action. A history of the 12th Armored Division: Hellcats 98 pages, good scan. NEW BOOK! These guys were in combat for 16 days, and fought in two major campaigns. They put out a nice history book, the 13th Armored division: A history of the Black Cats from Texas to France, Germany and Austria and back to California NEW BOOK! You’re synopsis of the 9th Armored is woefully dissmissive. The 9th AD was Middleton’s only reserve at the beginning of the Buldge. He sent each of it’s 3 combat commands to plug holes, in the north to St. Vith, in the middle near Clervaux and to the southern shoulder. 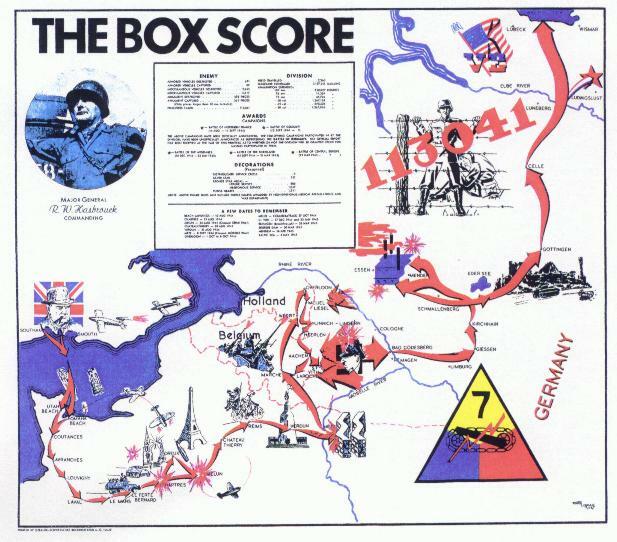 CCR aided the 110th Infantry in delaying the German timetable by at least 24 hours outside of Bastonge, blood for time, before the 101st Airborne arrived. CCB did the same around St. Vith. CCR started the battle with 56 Shermans, they left Bastogne with 17. Thanks for pointing that out, I’ll try and fix that this weekend. 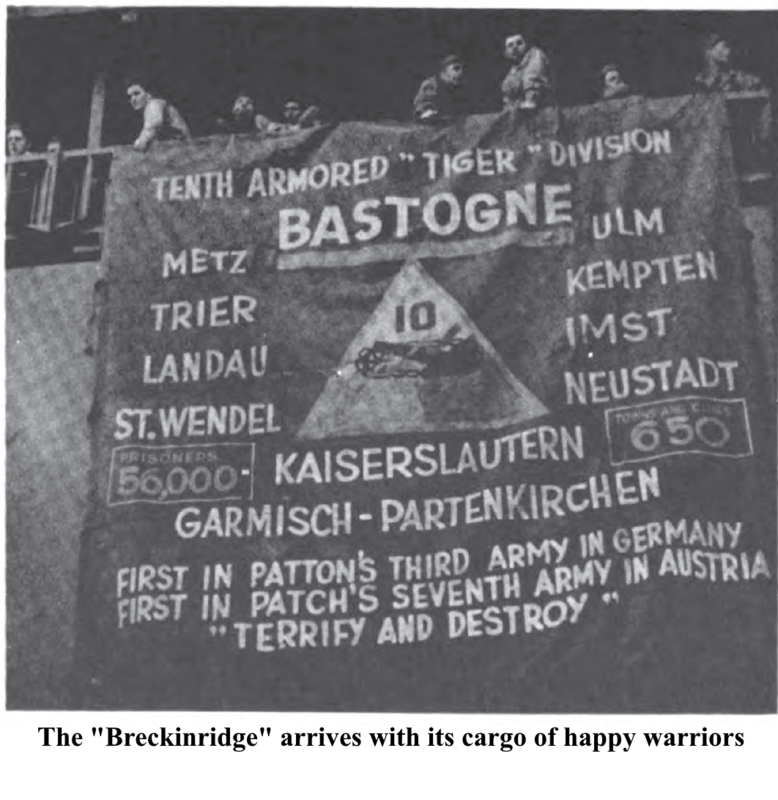 While under the h Armor Division, Vermont’s 1-1d and 2-1d Armored Battalions of the h Brigade excelled at tank gunnery and field exercises, making the h Brigade the only Army National Guard unit to ever consistently accomplish Tank Table XII, an honor it continued to earn even after the h AD disbanded. Just a note on the heavy armored division structure. It had three regiments. Two of these were armored regiments, each of which had one light and two medium tank battalions, The third regiment was an armored infantry regiment, consisting of three armored infantry battalions. There was also the division artillery of three armored artillery battalions. So the heavy armored division had two light tank battalions, four medium tank battalions and three armored infantry battalions. It also had two combat commands – in addition to the regimental headquarters. Though the light division lost a third of its tank battalions, it lost only 25% of its medium tank strength. The big difference was the infantry-to-tank strength. Though the light division had the same number of armored infantry battalions, the strength of each rifle company increased from 178 to 251, and the overall rifle strength rose by about 750. The infantrymen-to-tank ratio was thus raised from 6.1 to 1 in the heavy divisions to 11.4 to 1 in the light divisions. There were many reasons behind the reorganization of the divisions, not the least of which was ‘under new management’ as the previously semi-autonomous Armored Forces were integrated into Army Ground Forces. Here’s a good, detailed discussion of the issue, if anyone is brave enough to read it all! It includes an annex on composition and strength of the two types of armored division. Big help! Thanks for the info and the link!